If the selected scanner supports an automatic document feeder (ADF), you can select Autofeed or Autofeed (One) to scan the drawings. • Autofeed: Scans all the drawings in the ADF. • Autofeed (One): Scan the drawings in the ADF one at a time, and click Scan for each drawing. You can use the ADF to scan a stack of drawings continuously on a black and white scanner. Many scanner models support up to A3-sized paper in the ADF (15 field). If you are scanning a 16 field drawing, you may have to manually peg it on the scanner. Since you must splice the multiple drawings in a pan cel together once you’ve scanned them all, you cannot feed pan drawings through the ADF. When you use the black and white scanner’s ADF to scan a stack of drawings, the scanner optically detects the peg holes on the drawing and registers the image accordingly. 1. Launch the Scan module and load your drawing list. 3. Sort the paper drawings in your scanner in the same order as they appear in the Drawing List. The Scan module uses the Drawing List order to scan the drawings. ‣ To reselect the drawings you want to scan, select Edit > Drawing List. 5. Before placing the drawings in the ADF paper chute, make sure you position the paper guide closest to the back of the scanner as far out as it can go (towards the back of the scanner). 6. Place the drawings in the ADF paper chute (either face up or face down, depending on the type of scanner you have). ‣ The first drawing to scan must be at the bottom of the stack once you put it on the scanner, with the registration holes towards the back of the scanner (where the pegs are). ‣ When you place the drawings in the ADF paper chute, insert them so that they are slightly touching the paper guide closest to the back of the scanner, and the edge of the drawings lightly touching the inside of the ADF. Do not insert the drawing too tightly on the inside of the ADF or multiple drawings may feed through at one time, causing registration errors. 7. Slide the other paper guide over (closest to the front of the scanner) so that it slightly touches the drawings. You are now ready to scan your drawings. 8. Select a scanning mode from the Mode drop-list. ‣ If you want to scan the stack of drawings continuously without having to initiate the scan each time, set the scan mode to Autofeed. ‣ If you want to scan the drawings one at a time from the ADF, set the scan mode to Autofeed (One). 9. Click on the Scan button. The scanner begins to capture the drawings. Once you click Scan, this button and the Preview button become inactive during the scanning process. ‣ You can click the Stop button to interrupt the scan. For more information on interrupting the scan, see the topic . ‣ The drawing appears in the Image panel. ‣ You should check the drawings as the scanner captures them to ensure that the line quality is consistent from drawing to drawing. If necessary, you can adjust the threshold for a drawing. ‣ You can modify the scale to better view the drawings. ‣ If you select Autofeed from the Mode drop-list, the animator’s label for the drawing you just scanned appears in Last Scanned panel. The Last Scanned panel appears only in Autofeed or Autofeed (One) modes. A portion of the entire scanned image appears in this window. Scroll to the animator’s label using the scroll bars. ‣ The entire drawing appears in Frame Preview panel. ‣ When the scan is complete, the Drawing List tags the drawing as Scanned and highlights the next drawing. ‣ If an Optical Registration Error occurs, an error dialog box appears. • Make sure that you place the drawing correctly in the ADF and that there are no tears or rips on the drawing’s registration holes. You can try feeding and scanning the drawing again by clicking the Retry button. • The size of the paper you used may not be close enough to a standard 12 field paper size. The Scan module looks for the centre peg hole at a specific distance from the leading edge of the paper (give or take an inch). • To correct this error, you must scan these drawings on a flatbed scanner instead of using an ADF scanner. • To continue scanning and fix the drawing later, press the Skip Drawing button. The scanner marks the drawing as Not Scanned and the autofeed takes the next drawing. 10. 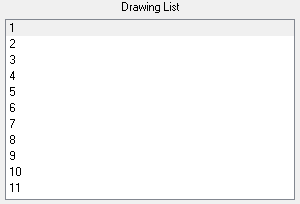 If you want to re-scan a drawing, simply select the cell name from the Drawing List panel and click Scan. ‣ Remember to change the feeding mode you selected before clicking the Scan button. If you are scanning one drawing, select Autofeed (One) from the Mode drop-down list. ‣ If you are re-scanning more than one drawing, select Edit > Drawing List, type the names of the drawings you want to re-scan, and click OK. If a paper jam occurs in the automatic document feeder (with the compatible scanners) you can use the Eject Page command to eject the jammed page. Select Scanner > Eject Page. If the option is not compatible with your scanner, the command will be greyed out.